Charles Kearns and his family moved to Bremerton, Washington in view of a call from God to start a church, being sent from the authority of Lakewood Baptist Temple of Lakewood Washington. 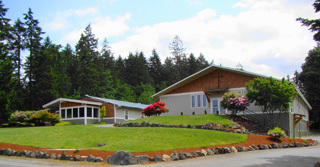 Westside Baptist Church was established in 1966 to spread the light of the glorious gospel of Jesus Christ in Bremerton and around the world. Bro. Kearns came without a salary, so he worked full time to make ends meet, while he pastored the people of Westside Baptist Church. His family paid a great price in their endeavor to see a church planted in Bremerton. The church started with just a few dedicated families and a lot of hard work. After three years, George Wambsganss along with his family were called to Westside Baptist Church. He was a strong man who became a father figure to many of the young sailors and young couples under his care. The church increased greatly during his time of ministry here; hundreds of souls were saved, and multitudes of lives were changed. It was during this time that our current property was purchased. A building from downtown was sold to the church for $1.00. The dollar sounded good, but the moving of the building to the property sounded terrible. The cost to move the building to the new property was around $25,000, expensive at the time, around $5,000 per family. The current Sanctuary was built and dedicated to the Lord just days before he passed away. After George’s death, his son, Bill Wambsganss was called to pastor Westside Baptist Church, a post that he held for 20 wonderful years. Bro. Bill was a man with a tender heart for God and people. Countless people in this community have been touched by the ministry of this humble servant of Christ. During his tenure the parsonage and the covered pavilion were built. Westside Baptist Church’s bus ministry flourished under his ministry. “Bro. Bill” as he is affectionately called is now traveling the country encouraging pastors and local churches through his ministry of preaching. In May of 2001, Craig Houston preached a revival meeting for the church’s 35th anniversary. During this year, unknown to anyone else, the Lord had begun to do a work on Craig’s heart regarding Bremerton. On April 28, 2002, he was called to be the pastor of Westside Baptist Church. While he has been here the church has seen tremendous growth, major renovation of the buildings have been done, and the Westside School of Ministry was established to train men to be spiritual leaders in their homes, community and the church. Westside Baptist Church has a desire to remain a lighthouse of the glorious gospel of Jesus Christ.